Ideal light waterproof parka that can fold into a little bag. Navy blue with white spots. When the weather is uncertain, this navy parka can prove very useful as it can easily be folded into a little bag and hidden away in your handbag. Light, waterproof and windproof, you can take it anywhere! Integrated hood, adjustable with pink rubber band. The parka can be closed using the zip and press studs. 2 lateral pockets closed by press studs. Rubber bands inside cuffs and in the back for a slightly fitted cut. 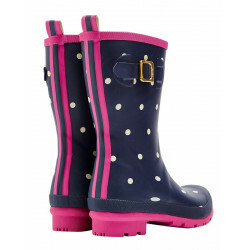 These fashion navy waterproof boots are the perfect attire for a walk on the seaside or as wet weather gear.